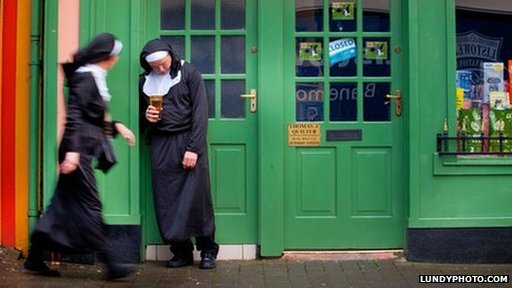 An Irish publican has been prosecuted after police found dozens of “nuns” drinking illegally, several hours past closing time on his premises. Christy Walsh, who runs the bar in Listowel, County Kerry, has been fined a total of 700 euros (£605) after his pub was raided twice in one night. He had helped to organise a charity event in the town last July, in which hundreds of people dressed up as nuns. Mr Walsh said he was “disappointed” but vowed to continue his charity work. 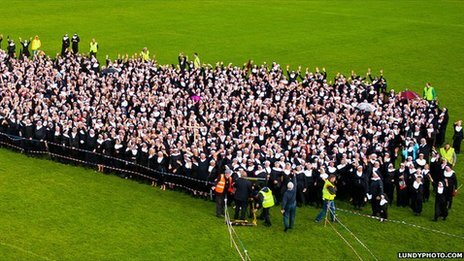 The Nunday event took place in Listowel on 30 June 2012, and set a new record for the “largest gathering of people dressed as nuns”. In total, 1,436 adults made a holy show of themselves at a GAA sports ground in the town. The volunteers donned nuns’ outfits and gathered in the field, where they were counted by officials acting on behalf of Guinness World Records. The adjudicators also made sure that the ‘sisters’ observed a strict dress code. It had to include a habit, a veil, black shoes and black socks or tights. Mr Walsh, who was a member of the Nunday organising committee, said the small town’s population doubled for the day as up to 3,000 extra people came to Listowel to either participate in or witness the unusual event. It was staged in aid of Pieta House, a suicide and self-harm awareness charity. However, after pub closing time, in the early hours of the following morning, police entered Mr Christy’s bar on two separate occasions, and found 51 ‘nuns’ on the premises. The officers first came in to the pub at about 01:45 BST, 45 minutes after closing time and found 30 people dressed as nuns. Their second visit was at about 04:10 BST, when they observed 21 ‘sisters’ still at the bar. Mr Walsh said he was at the premises for the first police visit and accepted that the police were “doing their job”. He said he was not there in person for the second visit, because he was driving people home. He claimed that many people found to be in the pub after hours were waiting on taxis. Mr Walsh said Listowel had a population of about 3,000 people and on a typical Saturday night there were only about 10 taxis to cater for late night revellers. The publican said he was disappointed by the decision to proceed with the prosecution. However, he appeared philosophical about it, adding that the event had raised around 26,000 euros (£22,500) for charity. The idea had come from a County Kerry couple, who had lost their 17-year-old son to suicide. Mr Walsh said when the nun costumes were suggested, the organising committee sought reaction from a local convent and from a parish priest before going ahead with it. He claimed that both saw the humour, agreed it was for a good cause, and “gave their blessing” to Nunday.